Use this page to navigate around the county and choose your base of operations. Orick: Gateway to Redwood National Park Located on Hwy 101 about 40 miles north of Eureka. Jumping-off point for Redwood National Park attractions including Prairie Creek Redwoods State Park, Fern Canyon, Newton Drury Scenic Parkway, Bald Hills Road, Lady Bird Johnson Grove, Elk Meadow & Trillium Falls, Lost Man Creek, Redwood Creek and more. Visitor information at the Thomas Kuchel Information Center, Hwy 101, one mile south. Overnight lodging including motels, B&Bs, RV parks and vacation rental cabins. Picnic supplies, gasoline and unique redwood burl & chainsaw sculpture artwork. Trinidad: A Seaside Retreat Located on Hwy 101, about 20 miles north of Eureka, set amid miles of beaches and stunning coastline, Trinidad is a picturesque fishing village. A convenient base for touring Redwood National Park, Patrick’s Point State Park and the beaches, trails and lagoons of northern Humboldt County. Attractions: Trinidad Head (hiking trails and views), Trinidad State Beach, Telonicher Marine Lab, Trinidad Memorial Lighthouse, Trinidad Pier, fishing charters and Cher-Ae-Heights Casino. Chamber of Commerce visitor information kiosk near Post Office & Murphy's Market. Overnight lodging includes B&Bs, numerous vacation home rentals, and many RV parks and cabins along Patrick’s Point Drive. Groceries and dining in town. Willow Creek: River Fun & Mountain Sun Located on the Trinity River, at the junction of Hwys 299 and 96 about one hour east of Hwy 101, Willow Creek is the gateway to Six Rivers National Forest. Headquarters for Trinity River fishing, whitewater rafting and backcountry touring. Attractions: China Flat/Bigfoot Museum, wineries, golf and farm stands. Chamber of Commerce visitor center at Hwy 299 and Hwy 96. Overnight lodging includes motels and vacation cabins. Groceries, supplies, guides and equipment rentals available in town. McKinleyville: Rural Charm with Modern Convenience Located just off Hwy 101, ten miles north of Eureka. 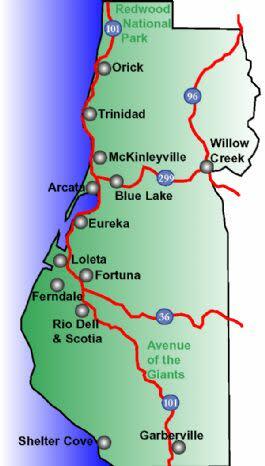 Location of the Eureka-Arcata airport (ACV) with connections to Sacramento, Portland, San Francisco, Los Angeles and Salt Lake City. Attractions: Clam Beach, Azalea Reserve, Hiller Park and a large portion of the Hammond Trail (coastal walking, biking and equestrian trail). Excellent services including grocery shopping, restaurants, hardware and K-Mart. Lodging at airport (Holiday Inn Express), dining on Central Avenue. Blue Lake: Sunshine and Sea Air Be entertained by many of the year-round productions brought to you by Dell'Arte International. Enjoy the Mad River Festival every summer, as Dell'Arte students, alums, staff and friends seriously clown. Stop in at the Blue Lake Casino (gaming, music, buffet lunch & dinner) with its new hotel. Go the Mad River Brewing Co. to sample some award winning brews in their sunny beer garden. Get away from it all and relax for a couple of days at the Chumayo Spa. Arcata: For the Young at Heart Located at the northern end of Humboldt Bay, near the junction of Hwys 101 and 299. Convenient location for touring Redwood National Park and northern & eastern Humboldt County. California Welcome Center (Hwy. 101, Giuntoli exit) with regional visitor information. Attractions: Arcata Plaza, Natural History Museum, Arcata Marsh & Wildlife Sanctuary, Arcata Community Forest and Farmers Market. Home of Humboldt State University and Humboldt Crabs Baseball. Hotels, motels, B&Bs, vacation rentals and dining. Coffee houses & bookshops at plaza. Eureka: The Victorian Seaport Centrally located on Humboldt Bay, less than one hour from Redwood National Park, Humboldt Redwoods State Park, Six Rivers National Forest and most of Humboldt County. Eureka is an “open air museum” of Victorian architecture, with hundreds of beautifully preserved and restored residential and commercial buildings. 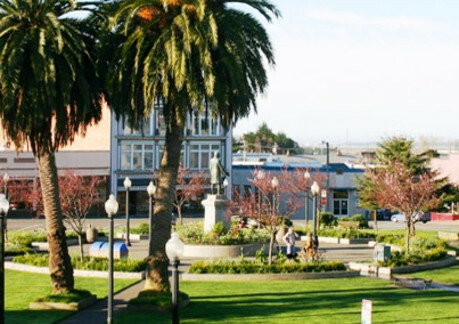 Old Town Eureka is a National Register Historic District with shops, restaurants, galleries and museums. The Eureka Boardwalk has views of fishing boats and wildlife. 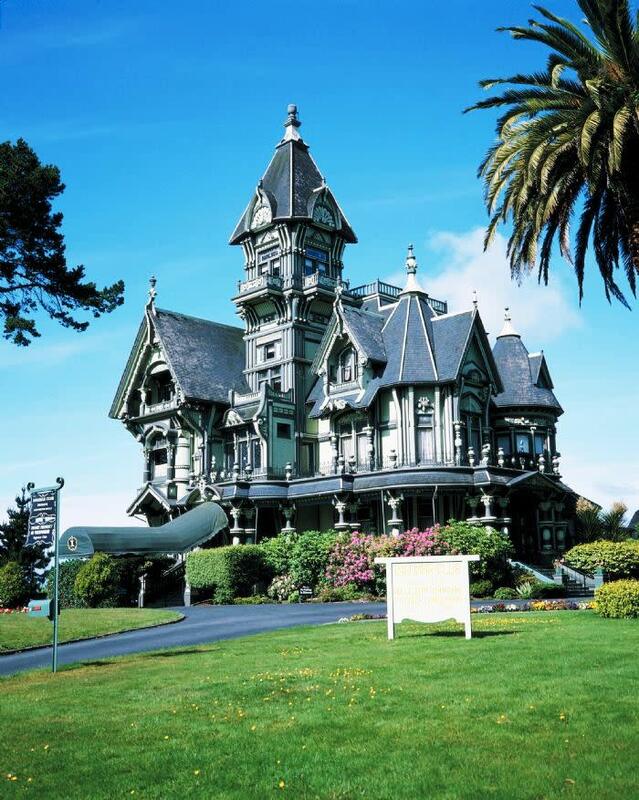 Attractions: Fort Humboldt State Historic Park, Morris Graves Museum of Art, Carson Mansion, Sequoia Park & Zoo, Blue Ox Millworks and Samoa Cookhouse Chamber of Commerce visitor center at 2112 S. Broadway (Hwy 101) at Hawthorne. Hotels, motels, B&Bs, vacation rentals and excellent dining, especially in Old Town. Loleta: Lo Le Tah are three Wiyot Indian words meaning "A pleasant place at the end of the water." Loleta has one of the most scenic vistas of the lower Eel River Valley. You can view dairy farms, livestock ranches, and the Pacific Ocean. It is also home to the renowned Loleta Cheese Factory and former Bank of Loleta building (358 Main Street), which was added to the California Historic Buildings list in 1985. Attractions: Humboldt Bay National Wildlife Refuge & the Eel River Wildlife Area, Table Bluff and Crab Park offering hiking, bird watching, and other recreational activities. Fortuna: The Friendly City Located on Highway 101 near the junction of Highway 36 (to Red Bluff). 30 minutes north of Humboldt Redwoods State Park. Many good choices for lodging and dining. Also known for great antique shopping. An all-American town with nostalgic Main Street, local events and old time hospitality. A convenient base for touring the Avenue of the Giants and Humboldt Redwoods State Park, Grizzly Creek Redwoods State Park, and the towns of Ferndale, Loleta, Rio Dell & Scotia. Attractions: Fortuna Depot Museum, Rohner Park, Riverlodge Conference Center with heather garden and the Eel River trail. Annual Rodeo and Auto Xpo. Chamber of Commerce visitor information at 735 14th Street. Garberville: Gateway to the Redwoods Located on Hwy 101, just north of the county line, Garberville is the gateway to Humboldt Redwoods State Park, Avenue of the Giants and the Lost Coast. Convenient to Richardson Grove State Park, Benbow State Recreation Area, and fishing, swimming, rafting & more on the South Fork of the Eel River. Good shopping for picnic and camping supplies, gasoline, etc. In summer, Garberville has a much warmer climate than that of Humboldt’s coastal towns. Chamber of Commerce visitor information at 782 Redwood Drive. Overnight lodging includes several motels and the historic Benbow Inn. Rio Dell & Scotia: Timber History Located on Hwy 101, about five miles south of Fortuna. Scotia was an original “company town” built around the redwood sawmills. 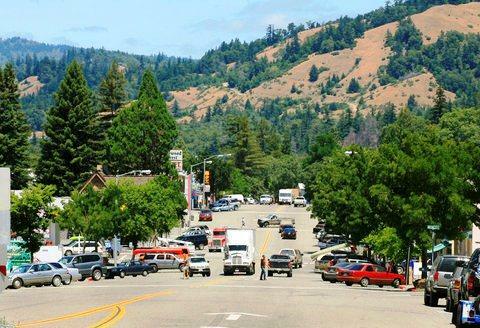 Rio Dell grew up across the Eel River, and was originally called Wildwood. Attractions: Scotia museum and Scotia Freshwater Aquarium. Lodging at the historic Scotia Inn and the Humboldt Gables motel. Shelter Cove: Splendid Isolation Located on the rugged Lost Coast, reached by a steep, twisty drive from Garberville/Redway via the Briceland-Shelter Cove Road. An isolated community of scenic splendor, ideally situated for enjoying the solitude and majestic beauty of the Lost Coast. Attractions: Black Sand Beach, Cape Mendocino Lighthouse, Mal Coombs Park, Golf Course and Fishing Charters. Overnight lodging including B&Bs and motels with sweeping views. Dining in town.